"Which came first: the chicken or this un((beat))able deal?" Broker Bodega, a new Tumblr, is putting us in stitches, and if you've ever paged through real estate listings, you'll get a kick out of it, too. 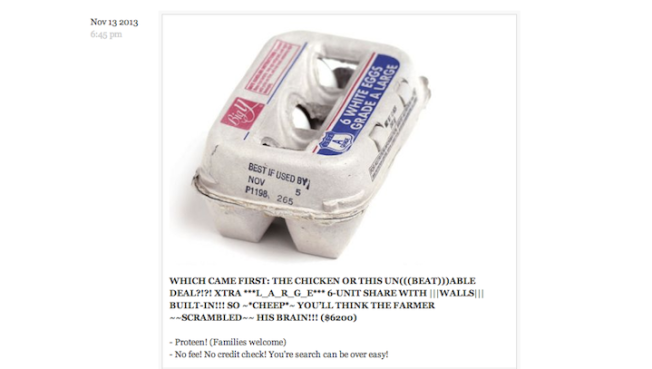 The site publishes photos of corner-store products, like this carton of eggs, and writes about them in broker-speak, exagerrating the promising features and accentuating the positive, using all the puns you could dream of. Other favorites: Sun Chips ("Sun-drenched chips! "), milk ("why buy the cow when you can get the milk no fee! "), and Fancy Feast cat food ("Me-wow!!! Not just fancy, it's a *feast*!"). Visit brokerbodega.tumblr.com to see more.